for an appointment. Ask for Rick. Evergreen Cemetery is honored to be the final resting place for so many important figures in Jacksonville’s history. 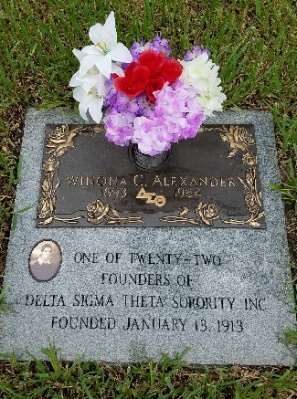 One such person is Winona Cargile Alexander, who was one of the original twenty-two founding members of the Delta Sigma Theta Sorority, Incorporated. The sorority was established at Howard University in Washington, D.C. on January 13, 1913. 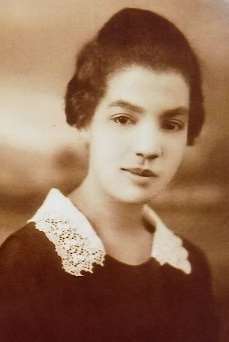 Among Winona’s other remarkable lifetime accomplishments included participating with her sorority sisters in the historic Women’s Suffrage March in Washington, D.C. in March of 1913, becoming the first person of color to enroll at the New York School of Philanthropy (now Columbia University School of Social Work), and serving as the first black Social Worker hired for New York City and New York County charities. She ultimately took a position in Jacksonville with the Duval County Welfare Board and put down family roots here. The local chapter of Delta Sigma Theta Sorority, Inc. sponsored proper recognition of Mrs. Alexander’s contributions to the organization, for which an unveiling ceremony was held Saturday, June 9, 2018. The memorial portrait from the ceremony for Mrs. Alexander is now displayed at the Ritz Theatre and Museum. This month, Evergreen is losing two outstanding employees. Brenda Rochester, who has been our receptionist for over 17 years, has decided to retire. Brenda has been the person you first see as you enter our offices and her voice is the voice you hear when you call Evergreen. She has represented Evergreen with style and grace, always kind, polite, helpful, and professional. Brenda’s replacement is Belinda Harper. Belinda, who has cemetery and funeral home office experience, has been working side by side with Brenda for the past few weeks, learning as much as she can to ensure that the change is as smooth as possible. Also leaving is Laurie Griffin. Laurie has been one of our family service counselors for the past four and a half years. During that time, she has helped hundreds of families make funeral and cemetery arrangements at their time of loss. She has been compassionate and caring with those that she has assisted and has always shared in their grief. Laurie is moving back to her hometown in Ohio to help take care of her aging mother. We hope to have a replacement for her soon. Both employees are quality people that will be missed, and we thank them for their service to Evergreen.